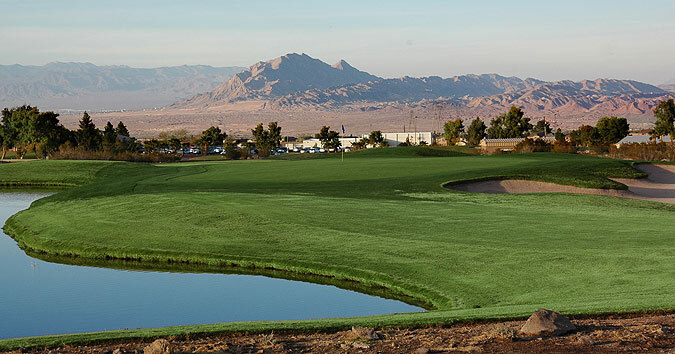 Located in Henderson, just 25 minutes from the Las Vegas Strip, Black Mountain provides golfers with an experience unique to the area. The course features rolling fairway, lush greens and strategically placed bunkers that can challenge golfers of all skill levels. More importantly, with wide landing areas and a traditional parkland layout, the design at Black Mountain allows beginning golfers to hone their games on a championship layout that won't beat them up. There are few forced carries, and only gentle undulations on the well kept putting surfaces. Three tee boxes allow play from 6550 to 5518 yards, with the mid-tees measuring 6223. The slope rating ranges from 71.6 to 69.8. 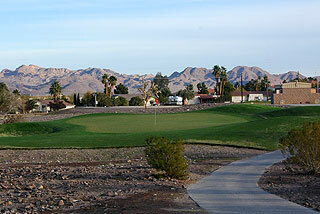 The front nine wanders through the Mojave Desert with wide fairways, and the back is a bit tighter, with tree-lined fairways and small sloping greens. Almost every hole provides a picturesque mountain backdrop. Founded in 1957, Black Mountain was one of the first courses built in the Valley, and is a semi-private club with 450 members. They claim the lowest initiation fees in the valley, with four categories of membership. Amenities include a full-service clubhouse, with pro shop, banquet and outing facilities for up to 175 people, two putting greens, short game area with practice bunker, and complete driving range with an additional private tee area for members. The on property restaurant serves breakfast and lunch, and also has a full -service lounge. Appreciated at this club are the vinyl sunshields that are featured on the carts. These shields are placed on the back and sides of the carts, making play much more comfortable, especially during the middle of the day and during the summer season. Ice water coolers are also standard. The course is well marked, with 150 yard stakes in the middle of the fairways, along with 100 & 200 yards yardage plates that are measured to the front, center and back. Pin Placement on the greens is indicated by color coded flags, and there is a green depth chart on each scorecard. The opening hole is straight and open, with fairway bunkers short left and right. This is an easy beginning hole. The second is a mid-length par 5 that bends to the right, with trees on the right side of the fairway. The recommended approach is from the left side. A deep bunker protects the front left and a water hazard looms right on the par three third. Avoid these obstacles and this is a good birdie hole. The fourth is very open off the tee, but narrows on the approach. There is a water hazard 40 yards from the green that features a beautiful mountain backdrop. Following is the longest hole on the course (544 yards), that plays towards a gorgeous mountain and presents one of the best birdie opportunities of the layout. The short par four sixth is also a very score-able hole. Together with the playable par 4 seventh, the short par 3 eighth, and the 16th handicapped ninth, this is the easiest 5-hole stretch on the course. Stay to the left center off the tee coming in, as mounds and bunkers on the right will hamper your shot making ability all the way to the green, which is sloped back to front. Land it below the hole on your approach, and you have a great opportunity to build some momentum for the backside. Number ten is straight but tight, with a tree-lined fairway leading to an elevated green that is well protected by bunkers. The 11th is a pretty hole that is open off the tee but narrow on the approach with trees on both sides. The par three 12th is also quite picturesque, featuring an elevated green complex with numerous sand traps. After an short and easy par five, you are confronted with the number one handicapped hole - the par 4 fourteenth. It is fairly open off the tee, but narrows on the approach with trees and bunkers flanking the putting surface from both sides. Fifteen is perhaps the easiest par 3 on the course, and is followed by a short par four that plays tough, due to the elevated green and mounding all around. Aim just past the 150 off the tee for the best results here. 17 is a tight driving hole. Bend a long one to the left, or lay up just right of the 150 stake, as anything short left will be blocked by trees. The finishing hole at Black Mountain is wide open, though placement to the right of the 150 is the preferred location here. Trees block an entry from the left, as you approach a huge putting surface with a ridge running across the front. A strong finish is possible on the short par five. You won't be blown away by a visit to Black Mountain. It does not claim any pretence or novelty about a themed design that many courses in the Vegas Valley strive for. This is simple golf with excellent service, and conditions that will make you feel like your reasonable green fee was well spent. With property values at a premium and with many of the courses in this area priced between $150 - $250 during the prime season, Black Mountain is a good choice as a supplemental round, and is great place to take golfers who want to enjoy a relaxing round. They invite you to be a member for the day - we certainly felt that way on our visit. 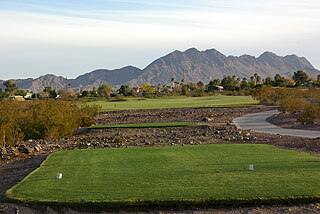 Visitors to Black Mountain will be pleased with the latest 9-hole addition - the Desert Nine. Designed by William Gill Associates, this new nine is the best at Black Mountain, with wonderful conditioning from tee to green along a 3,300 yard track that features risk/reward opportunities associated with desert golf. 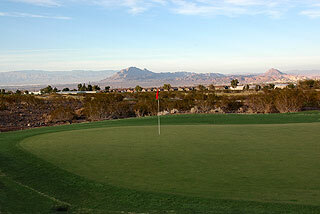 There are not long forced carries and the fairways are lush and generous, but the desert is always within reach. Throw in some water hazards, white sand bunkers and gorgeous mountain backdrops, and it becomes apparent that Black Mountain Golf Club has upgraded. This is a beautiful layout, which can be mixed in with the existing nines on the original 18-hole course - making for a great golfing experience. It is worth the 25 minute ride from the strip. And Black Mountain still features the wonderful wedding terrace, and banquet/outing facilities that can cater to a wide variety of groups.